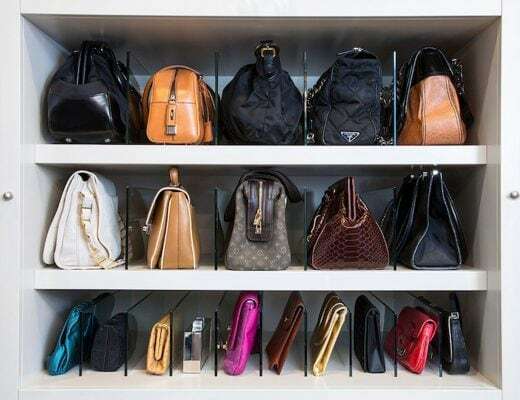 A “designer snakeskin handbag” can be mesmerizing, but when this exotic purse needs restoration, a meticulous process of polishing, glazing and desalting stains is required to care for your designer handbag. Because the scales of snakeskin bags dry out and shed with age and improper handling, simple repairs are necessary to extend the life of your designer handbag. Determine the smooth sides of your snakeskin handbag scales. Dislodge dirt from the snakeskin scales with a clean white cloth. Clean your bag with a leather conditioner. If there are salt stains on your snakeskin handbag, remove them with a desalting liquid. Use neutral polish to combat fading leather on the handles of your purse. Repair flaking snakeskin handbags with glazing. 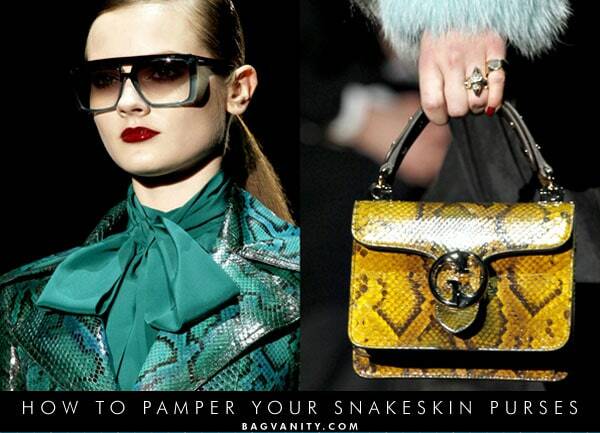 Run your fingers along the skin of the snakeskin bag. The natural direction of the scales will be either smooth to the touch instead of rough. Dab the end of the cloth in cool water. Pat the scales down gently in the natural direction of the skin to remove the dirt. Use water sparingly without soap. 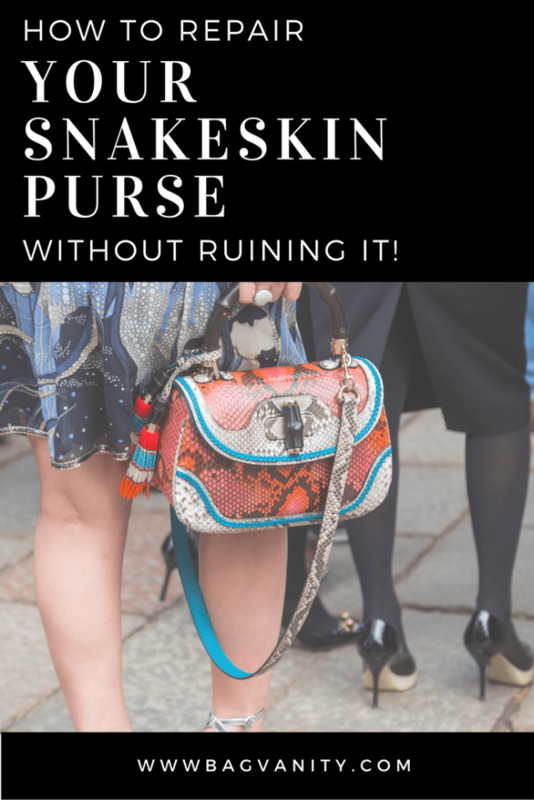 Too much liquid applied to the surface of your purse may discolor the scales permanently by reacting with the tannin used during the modification of the snakeskin. Lightly, press the surface of the bag with the cloth to apply the conditioner to the snakeskin or python scales. If you are concerned about damaging the exotic skins, test the leather conditioner on the bottom of your purse. Apply a teaspoon of the desalting liquid on a small microfiber or lint-free cloth. Dab the spots gently. Air dry away from heat. After the skin dries, apply a leather conditioner made specifically for snakeskin and exotics. Clear leather polish may restore the leather handles on the bag. Before applying polish on the handbag, patch-test a small section. Avoid wax polish; it is too heavy. Do not rub the polish into the scales. The polish will add extra weight and a light layer of film to your purse. A professional handbag restorer applies a clear glaze to the skin to return the scales to their original shine and luster. Costs to reglaze a small snakeskin purse in 2016 may range from 100 to 200 dollars. With a variety of luxe styles, shapes, and fashionable colors, these must-have designer snakeskin bags work double duty as sophisticated daytime or nighttime accessories. Have your snakeskin handbag professionally cleaned once a year to maintain the bag’s shine eye appeal. Apply conditioning treatments, desalting liquids and neutral polish on the smooth portion of the snakeskin scales, which is the natural snakeskin grain, according to Snakeskin handbag repair experts VintageSkins.com. Before you wear your handbags, always apply a light coat of Collonil waterproof spray to protect your exotic skins from accidental spills, rain, and dirt. I use this Collonil spray because it is the best product on the market to reduce dirt and water marks and clean a soiled snakeskin purse. It is important to condition your snakeskin or python handbag regularly. 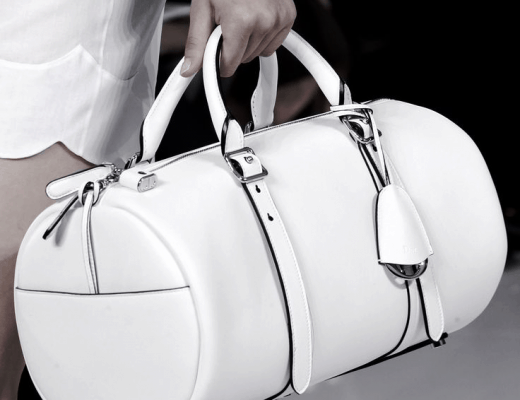 Condition it once every three to four months to extend the life of your handbag. If your snakeskin handbag gets wet, the leather may darken beyond repair, suggest the handbag repair experts at Gleni. Great article and helpful tips. It’s nice to see that people still take the time to teach others by offering free advice and information. That’s what keeps ‘em coming back! I recently purchased a small clutch purse that appears to be real snake skin. It has a different look than the ones you would see in walmart, and it “lifts” on the scales if you run your hand along the scales the wrong way. The bag has a small tag inside saying “Made in the Phillippines” but that is all I know. Do you know how I can tell if this is real snakeskin? If so, how much is this worth?